The Sirens (Greek, entanglers) enticed seamen by the sweetness of their song to such a degree that the listeners forgot everything and died of hunger. Their names were, Parthenope, Ligea, and Leucosia. was derived from one of the sirens, whose tomb was shown in Strabo's time. Poetic legend states that she threw herself into the sea out of love for Ulysses, and was cast up on the Bay of Naples. The celebrated Parthenon at Athens, the beautiful temple of Pallas Athenæ, so richly adorned with sculptures, likewise derives its name from this source. Dante interviews the siren in "Purgatorio," xix. 7–33. 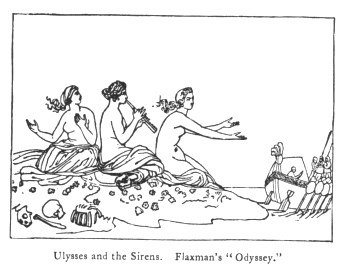 Flaxman, in his designs illustrating the "Odyssey," represents the sirens as beautiful young women seated on the strand and singing. 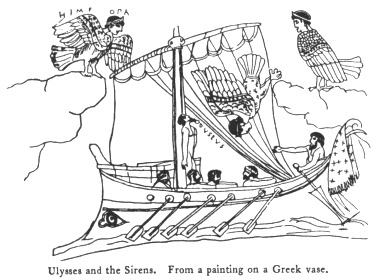 gives a Grecian rendering of the story, and represents the Sirens as birds with heads of maidens. is said to have changed their bodies into those of birds, because they refused to go to the help of their companion, Persephone, when she was carried off by Pluto. "They are represented in Greek art like the harpies, as young women with the wings and feet of birds. Sometimes they appear altogether like birds, only with human faces; at other times with the bodies of women, in which case they generally hold instruments of music in their hands. As their songs are death to those subdued by them they are often depicted on tombs as spirits of death." By the fables of the Sirens is represented the ensnaring nature of vain and deceitful pleasures, which sing and soothe to sleep, and never fail to destroy those who succumb to their beguiling influence. To allure weak travellers, whom gotten they did kill." To hear the sea-maid's music." Commentators of Shakespeare find in this passage (and subsequent parts) certain references to Mary Queen of Scots, which they consider beyond dispute. She was frequently referred to in the poetry of the time under this title. She was married to the Dauphin (or Dolphin) of France. The rude sea means the Scotch rebels, and the shooting stars referred to were the Earls of Northumberland and Westmoreland, who, with others of lesser note, forgot their allegiance to Elizabeth out of love to Mary. "Few eyes," says Sir Thomas Browne, "have escaped the picture of a mermaid with a woman's head above and a fish's extremity below." In those old days when reading and writing were rare accomplishments, pictured signboards served to give "a local habitation and a name" to hostelries and other places of business and resort. Among the most celebrated of the old London taverns bearing this sign, * that in Bread Street stands foremost. 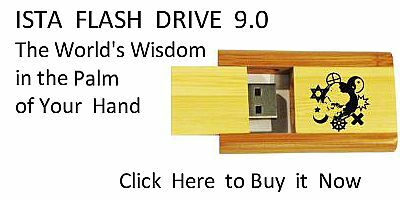 (Right witty, though but downright fools) more wise." 252:* The sign was also used by printers: John Rastall, brother-in-law to Sir Thomas More, "emprynted in the p. 253 Cheapesyde at the Sygne of the Mermayde; next to Powlsgate in 1572." Henry Binnemann, the Queen's printer, dedicated a work to Sir Thomas Gresham, in 1576, at the sign of the Mermaid, Knightrider Street. A representation of the creature was generally prefixed to his books.—"History of Sign-boards," p. 227.